Someone asked for some revision suggestions recently. They were suddenly covering for an absent colleague with a few hours notice for a full day Y11 revision day. These are some of the techniques I’ve used which have earned their keep from one year to the next. The first two are for Geography GCSE groups. They may be adaptable to other subjects or they may kick off the odd idea or two. The second two are more generic. Put a sheet on each desk (spread them out so ‘similar’ questions aren’t on adjacent desks. Give each pair a distinctive writing implement (colours / pens / felt tips / pencil….) and record which pair is using what colour. Once time is up pairs pass sheet to next table in front / behind (snake a continuity around the room so you only have to take the one from one ‘end’ and give it to the ‘other’. Challenge students that there will be awards for the pair that puts a) most information b)most sophisticated information b)new information that you, the teacher, weren’t aware of…etc. Keep it going for as long as you can. Sometimes a class will persist with all 14 sheets going round the room till they have their original back, others – tend to draw it to a close when they look as if they’ve had enough. Pose an exam question on the topic at the end to see how much they’ve remembered and can apply. 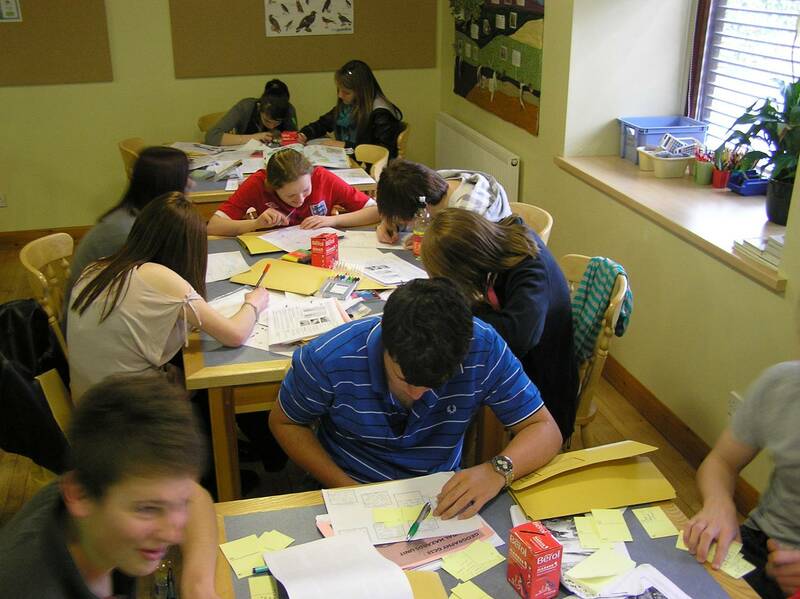 Students write a memo to themselves concerning their revision on the basis of the outcomes of the exercise. This is what I set up on our residential for a 2-hour session. 6 tables that groups of 4-5 students move round to every 20 mins. Table 2 : Geography Dominos. You have to ‘prime’ this one. Take 10 or so blank cards, draw a line down the middle and put Q in top left and A in top right. Then pose 10 Qs on the top, one on each card. The students who come to the table then have to answer the 10 Qs set them, and on 10 new cards set 10 more Qs for the next group on a different topic. (a variation on this could be ‘if this is the answer, what’s the question? When you give the ‘answers’ on the right hand side, and students have to decide what the question must be to produce that answer). Table 3 : Exam Marker – print off 3 exam answers from previous students – ‘high’ ‘mid’ and ‘low’ level. Leave them for students to work out which is which, and to highlight the parts of the answer that makes one better than another. Provide the exam mark-criteria for that question. Ask students to allocate marks to the 3 answers and justify. (This is the group I usually sit with for the last 10 mins to discuss what conclusions they’ve come to and why). Table 4 : Revision flash cards. Like ‘Mind Maps’ – but bullet pointed cards. Allows students to see which type of note-making they personally find more effective. Table 6 : Consequence Chains: Pile of post-its of 2 colours. One is the ‘This is because…’ colour , the other is the ‘Because of this…..’ colour. Give students a list of key features of a topic (eg ‘Pyroclastic Cloud’) and they have to build up as long a chain of ‘causes’ and ‘consequences’ – each on a different post-it – as they can. You could do the same with ‘hexagons’ – making chains of consequences/causes. Students challenge each other in competitive pairs to see who knows most on a given topic.